We are located north of Victoria off HIGHWAY 17 at HALIBURTON Road about 8KM or 5 miles. Look for the #17 HWY NORTH-BC FERRIES sign and follow out of town for about 10 minutes. PASS the ROYAL OAK DR. exit and at the NEXT set of lights turn RIGHT onto HALIBURTON Road and immediately RIGHT onto CHERRY TREE BEND. You have arrived at The Cherry Tree Inn! exit onto #17 HWY. SOUTH. Follow for about 15 minutes, ELK LAKE in on your RIGHT. At the NEXT set of lights turn LEFT onto HALIBURTON ROAD and immediately RIGHT onto CHERRY TREE BEND. You have arrived at The Cherry Tree Inn! Near the Victoria approach follow the signed from #17 HWY-BCFERRIES NORTH onto MCKENZIE then only #17 HWY NORTH. PASS the ROYAL OAK DR. exit and at the NEXT set of lights turn RIGHT onto HALIBURTON ROAD and immediately RIGHT onto CHERRY TREE BEND. 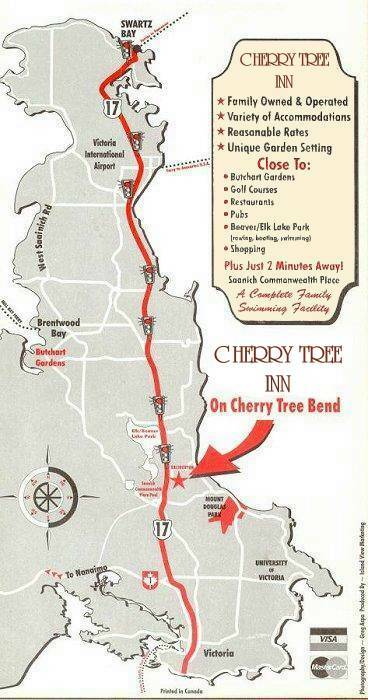 You have arrived at The Cherry Tree Inn!